The Ratiolab HandyStep® Electronic Pipettor for Serial Dispensing is a hand held dispenser with microprocessor controlled precision. While most dispenser tips will fit the HandyStep, if it is used with available PD-Tips with Typ-Code, the tip volume will automatically register. Digital display of volume, number of steps, operation speed, mode and battery level. The volume is adjustable from 1 µL to 50 mL. Three operation speeds can be selected to accommodate various viscosities and densities of liquids. 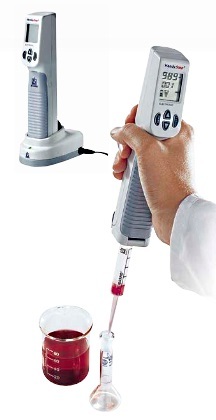 There are three operating modes, single volume pipetting, repeat dispensing, and Autodispense, in which the HandyStep monitors a user's timing and dispenses with the same rhythm as long as the dispense button is pushed. The battery can be charged within the instrument or separately. A remarkable motorized serial dispenser that is comfortable for use with either hand, reduces strain, error and the amount of repetitive action on the part of the operator. Easy programming by an intuitive guided menu.